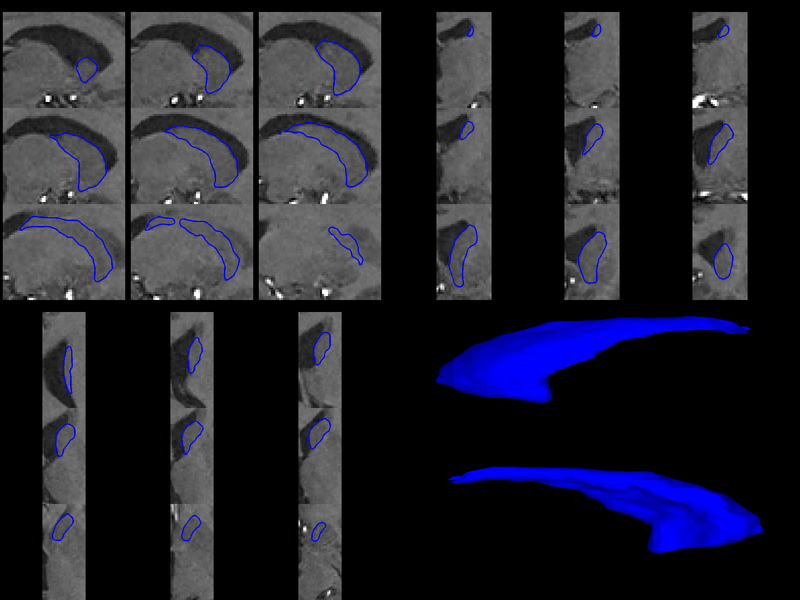 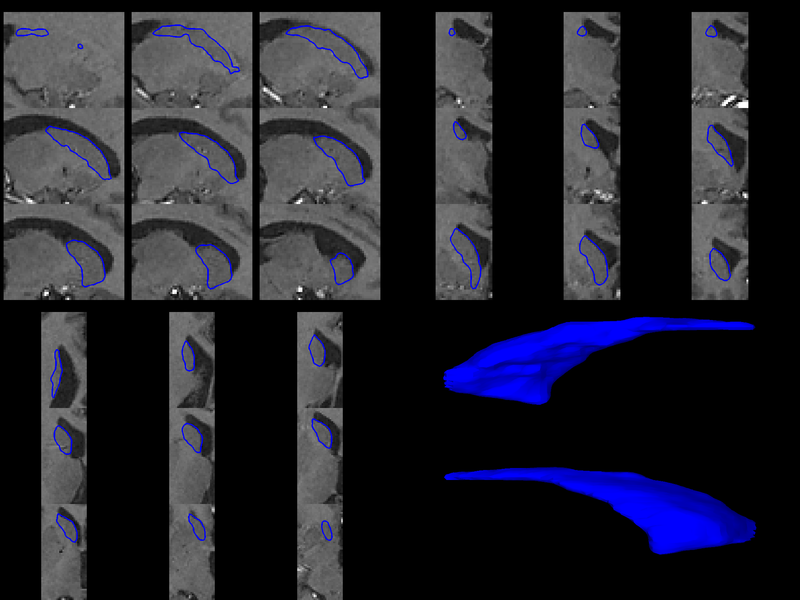 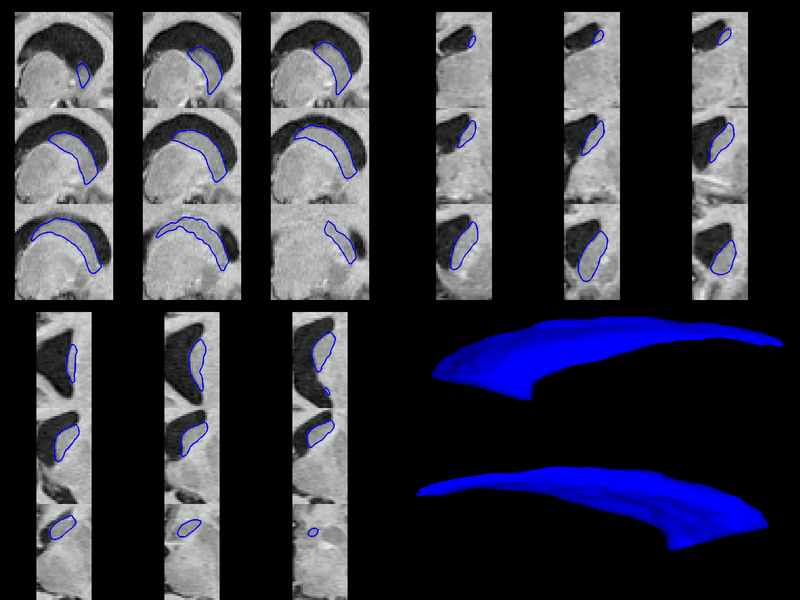 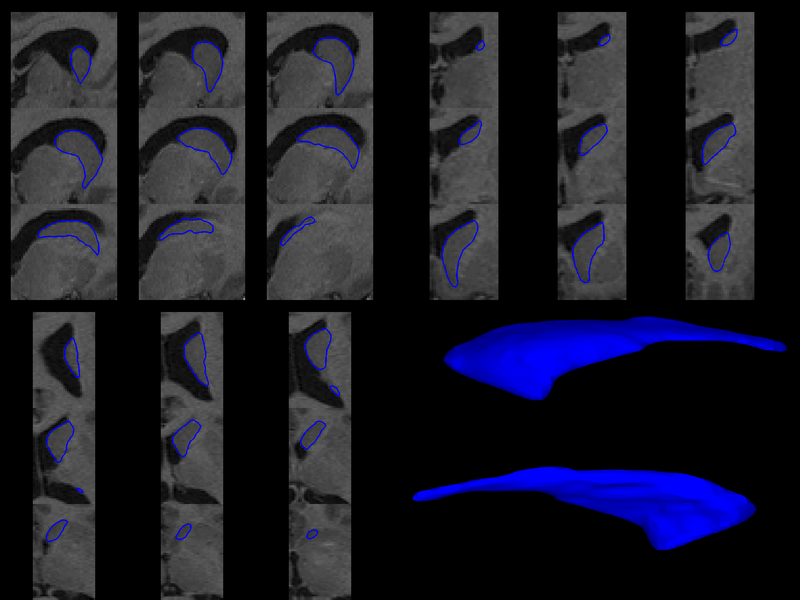 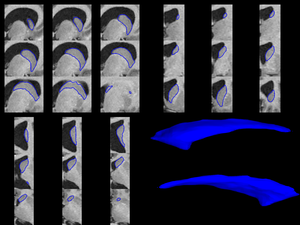 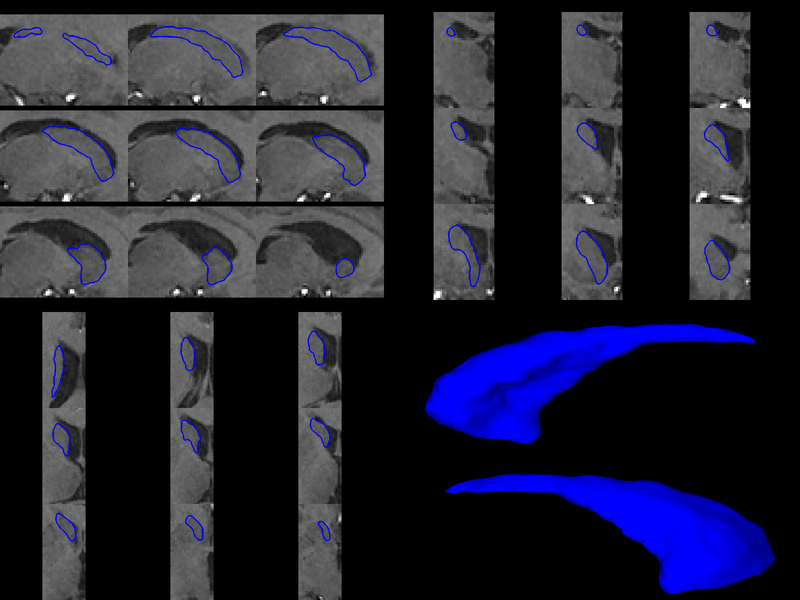 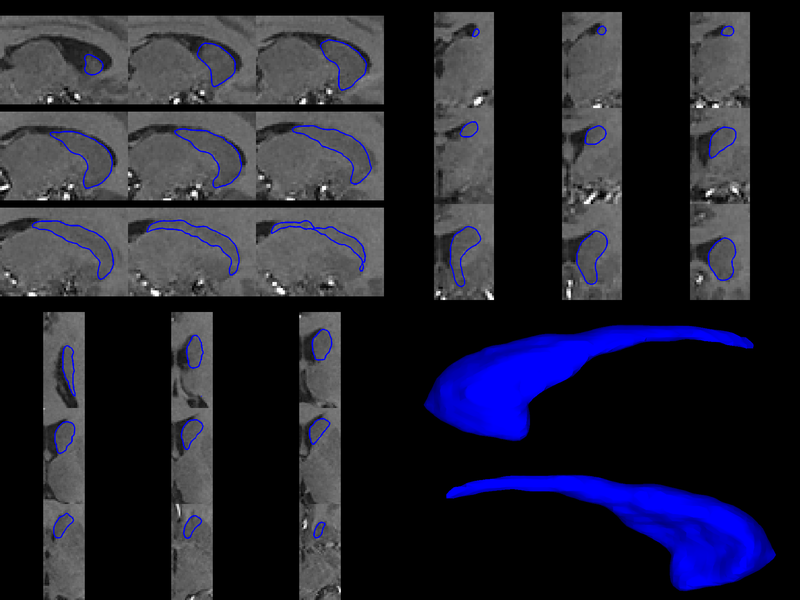 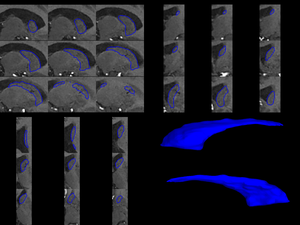 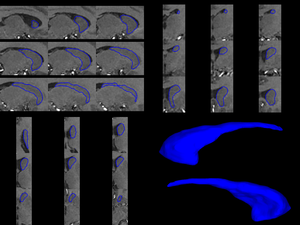 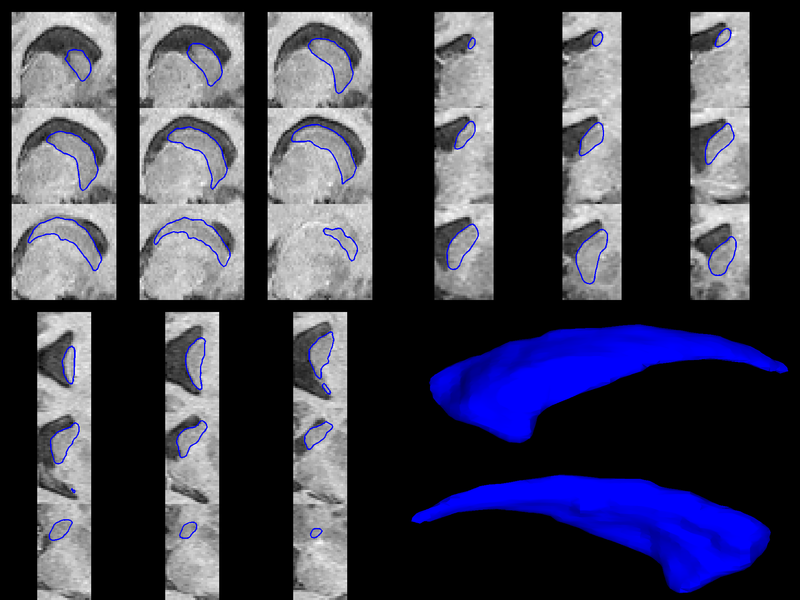 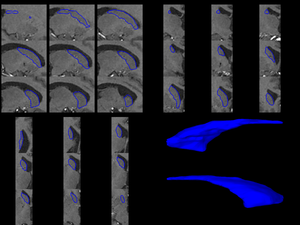 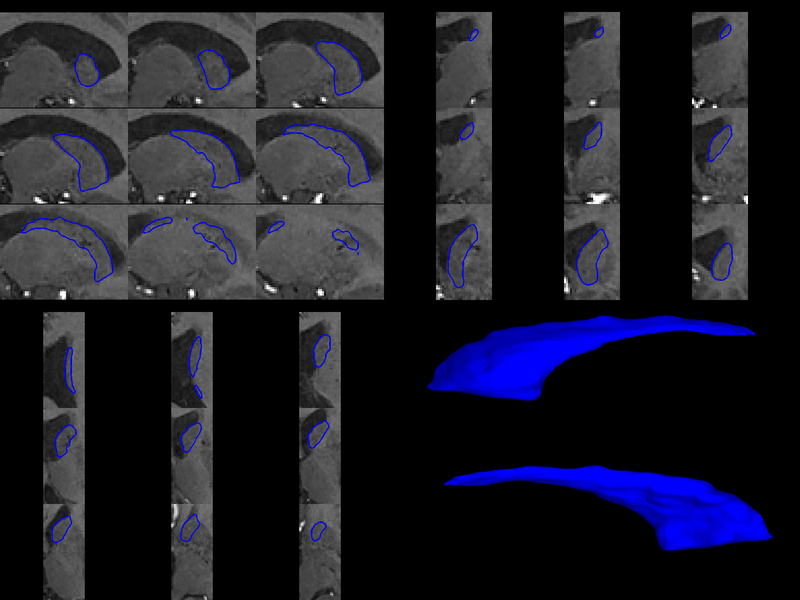 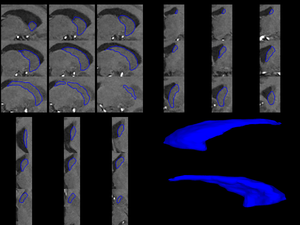 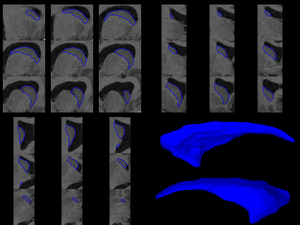 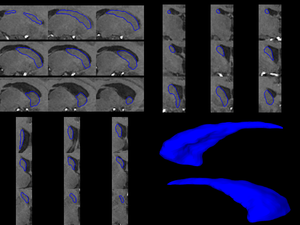 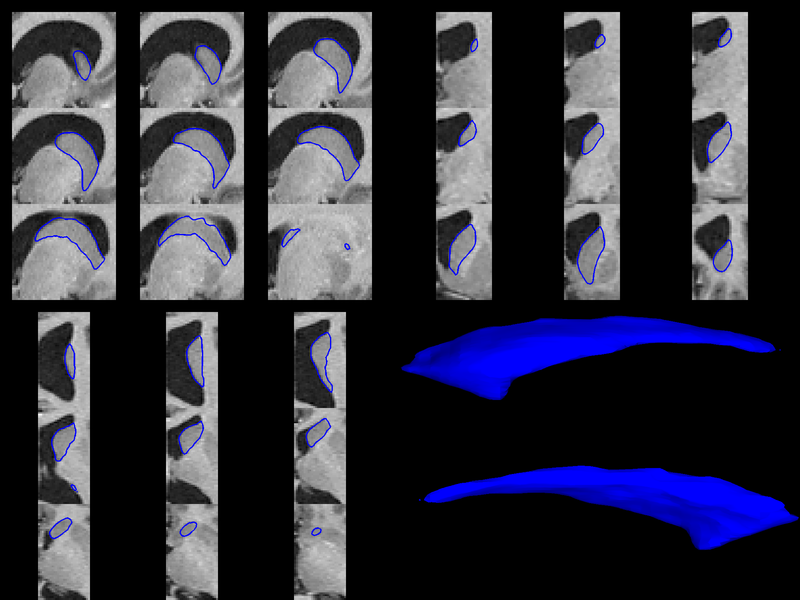 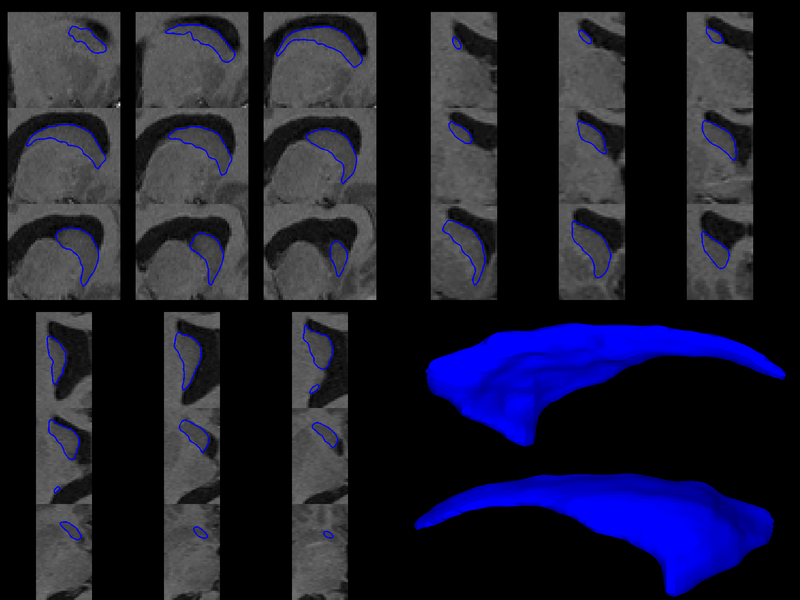 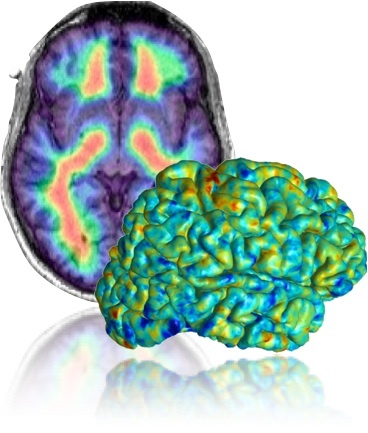 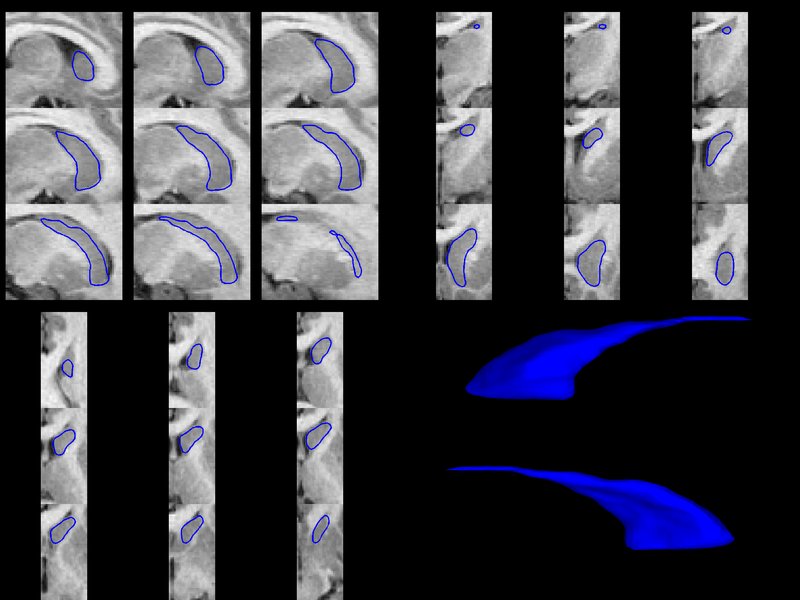 We submitted results with our multi-structure, multi-atlas variant of FS+LDDMM (currently under review) to the ongoing caudate segmentation evaluation, CAUSE07. 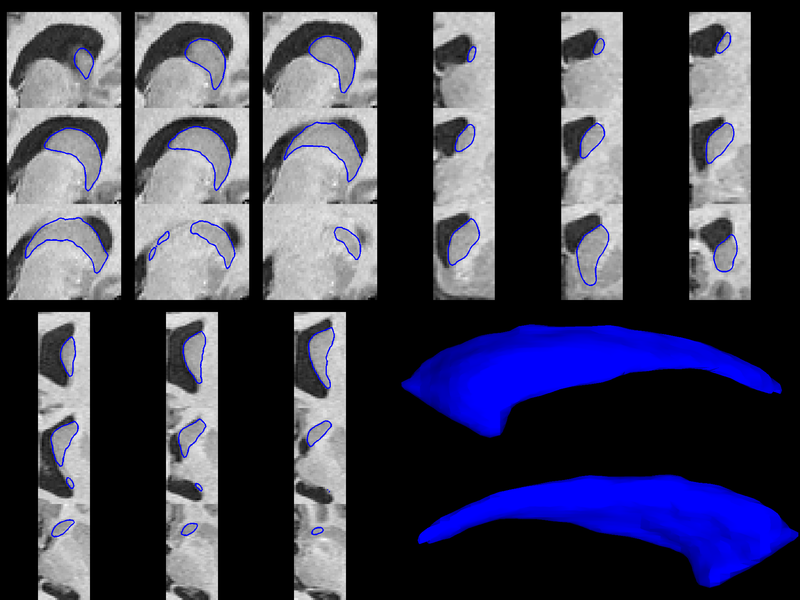 Researchers from all over the world can download the test data, perform their caudate segmentation, and submit the results back to the website where the manual segmentations (not available to the entrants) are used to calculate a performance score. 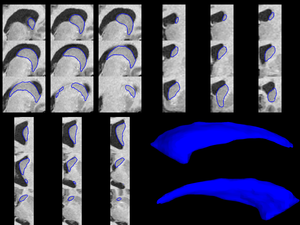 Our method ranked #2 overall, with an overall score of 75.99. 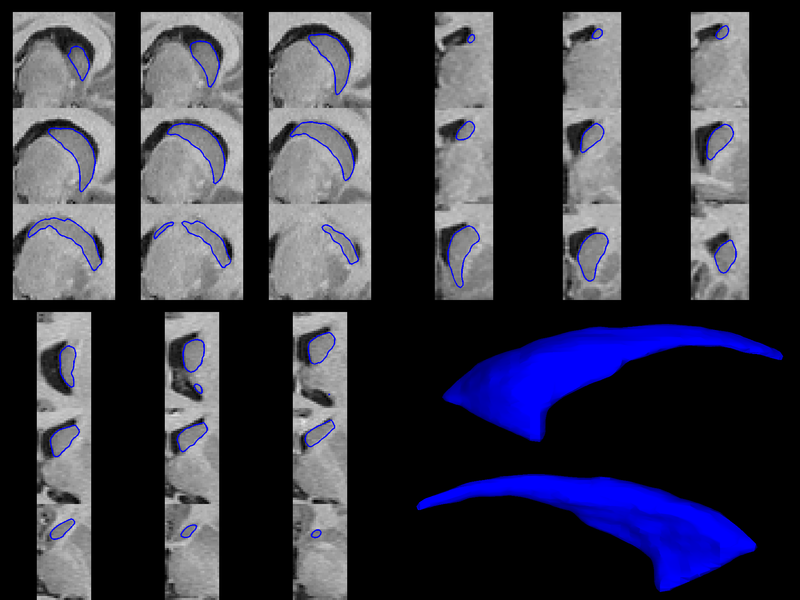 The scores are based on an average of five scores based on the: overlap error, volume difference, average surface distance, RMS surface distance, and max surface distance. 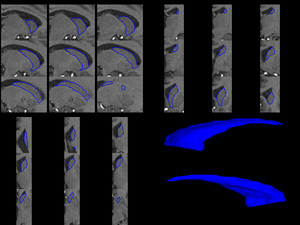 For more details please see below, and the CAUSE07 results webpage. 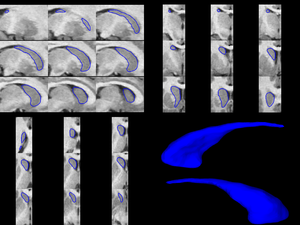 Also computed in the results, but not included in the scoring system, was the Pearson correlation of the volumes; our method currently has the highest correlation of all methods, with an average of 0.81. 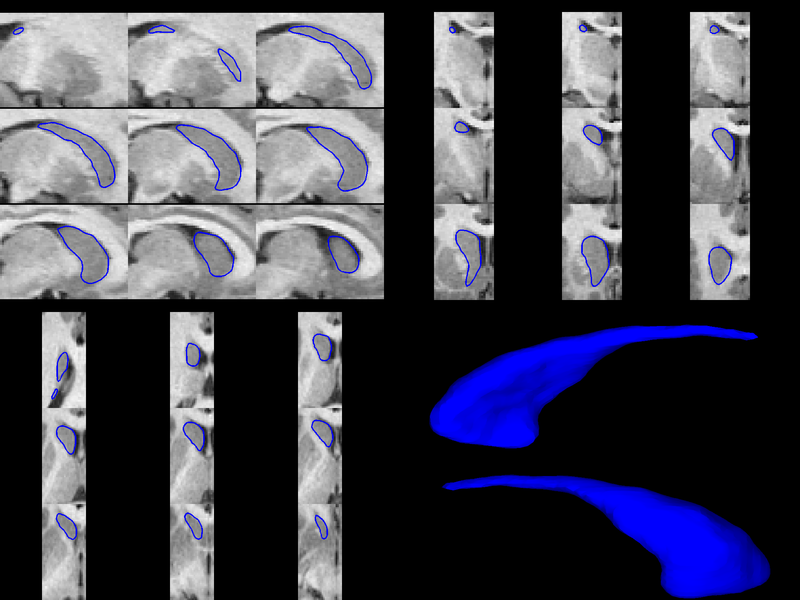 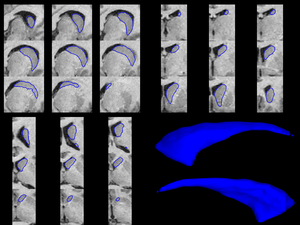 Notably, the current ranked #1 method has an average correlation of 0.17, which means the segmentations could not be used reliably in a volumetric study. 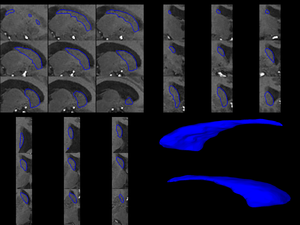 Please see below for a detailed look at our automated segmentations (prior to binarization for submission). 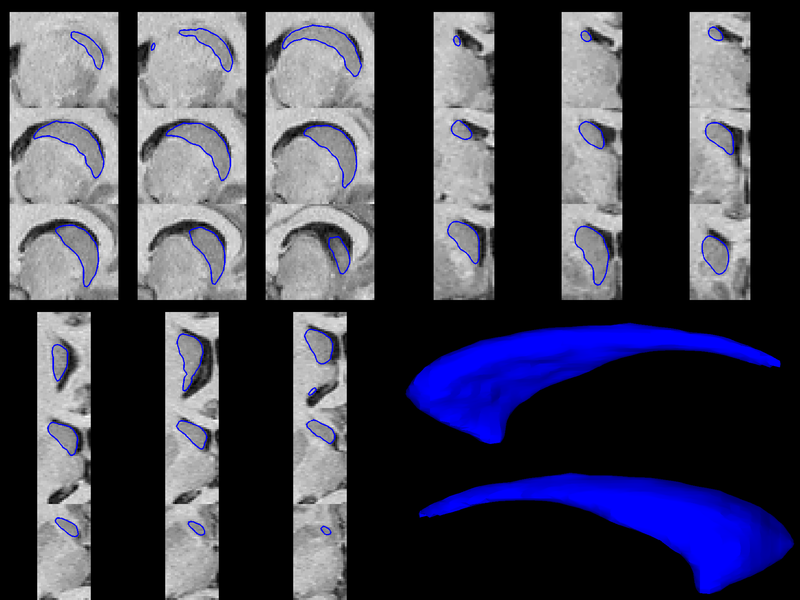 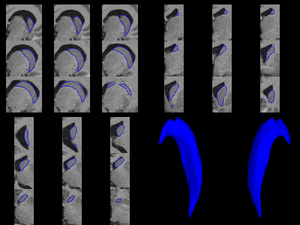 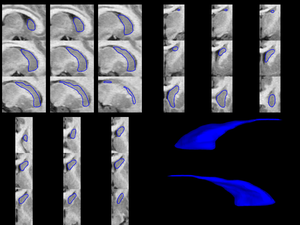 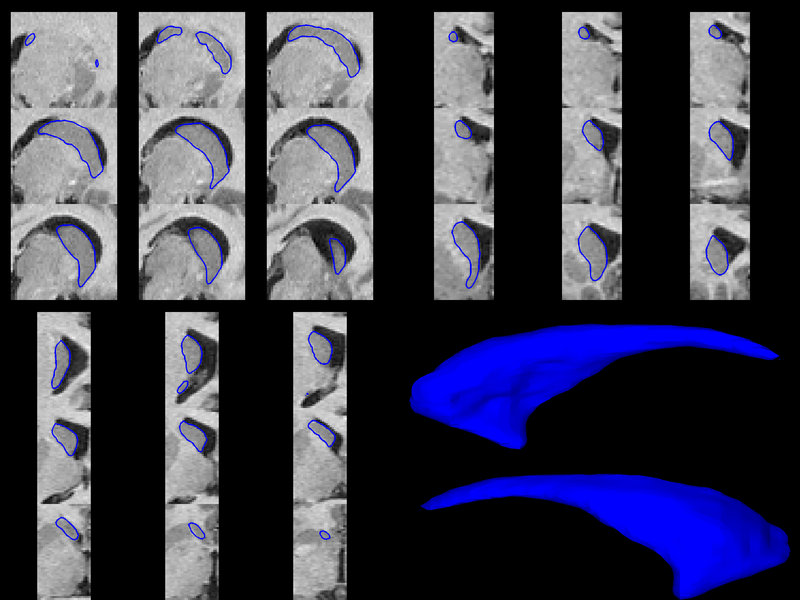 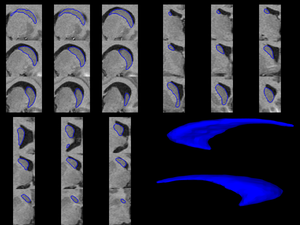 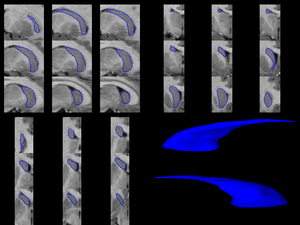 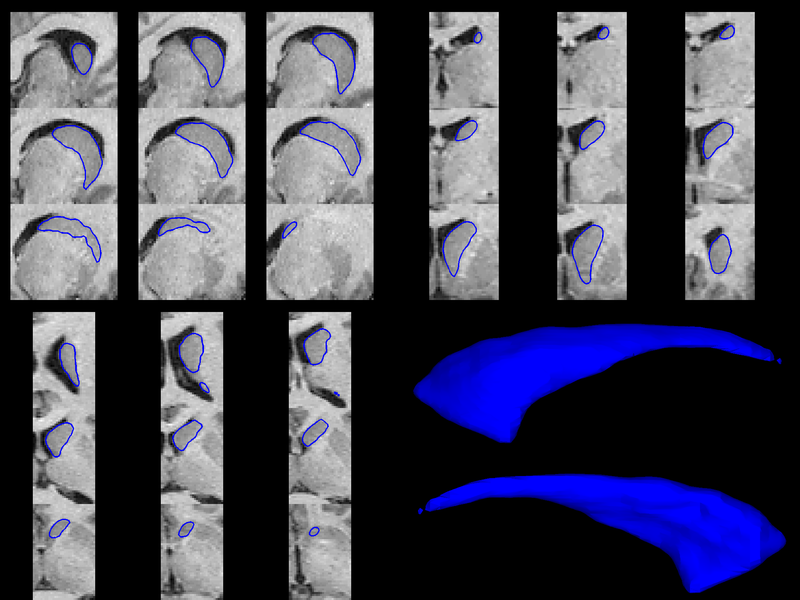 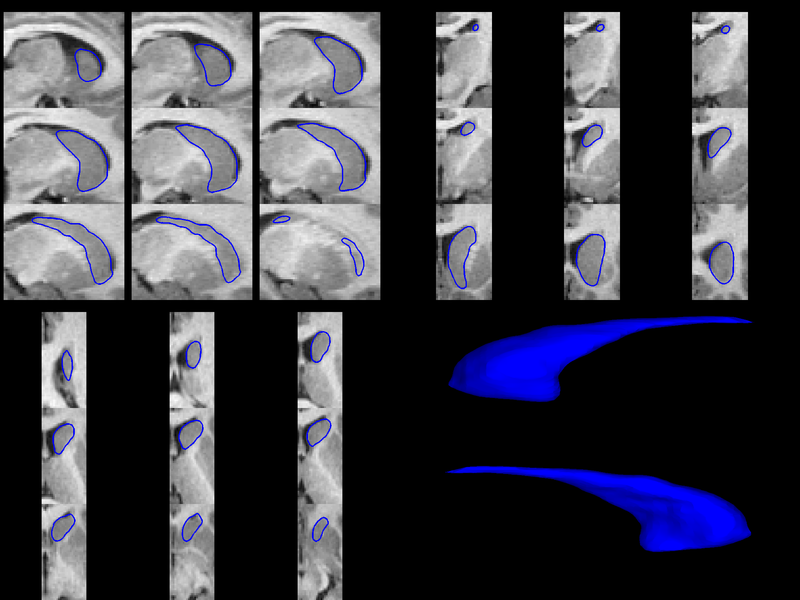 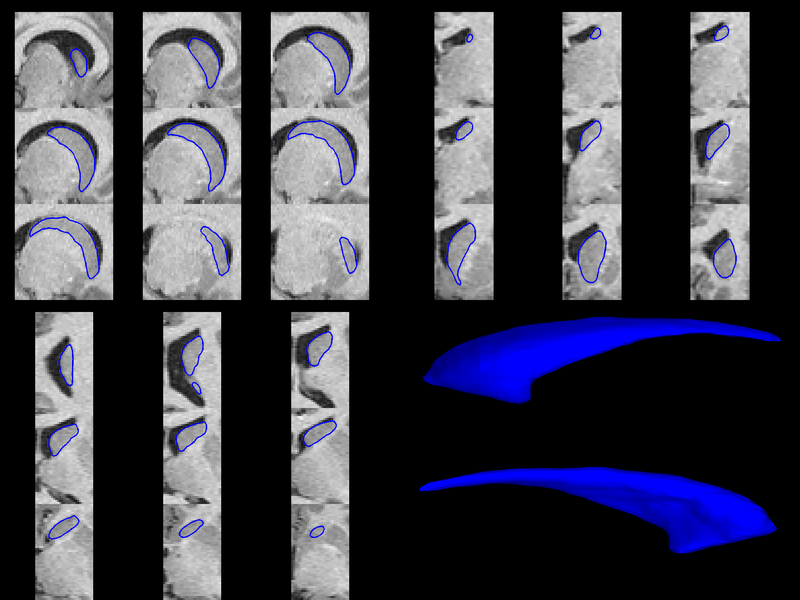 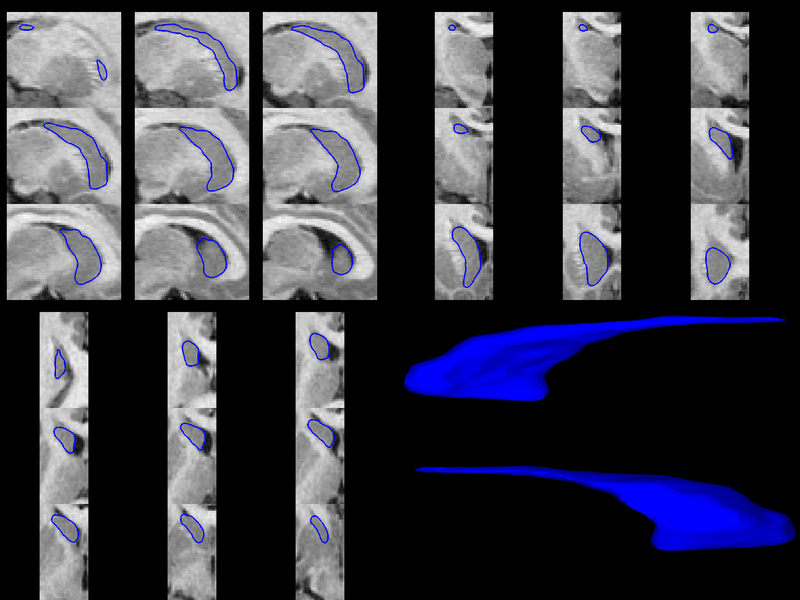 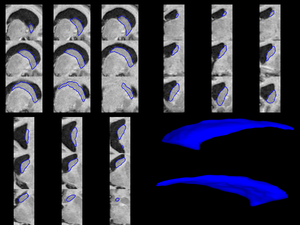 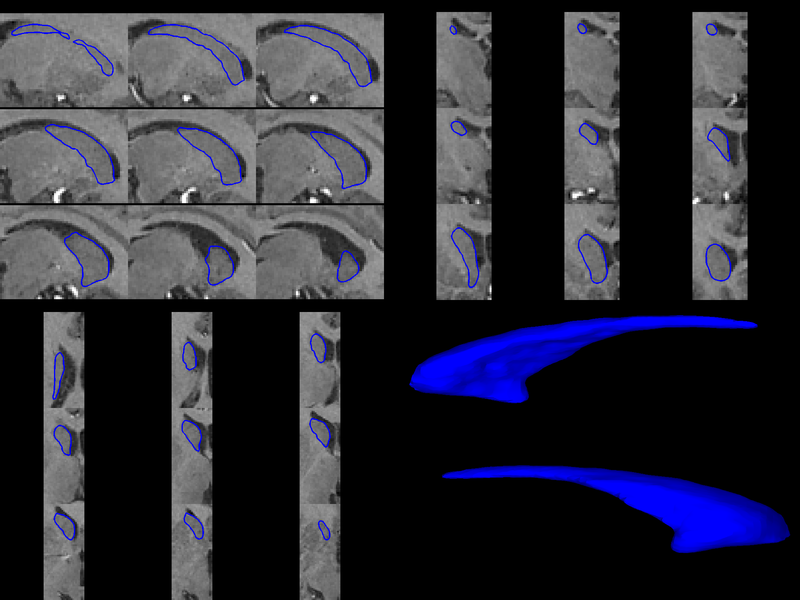 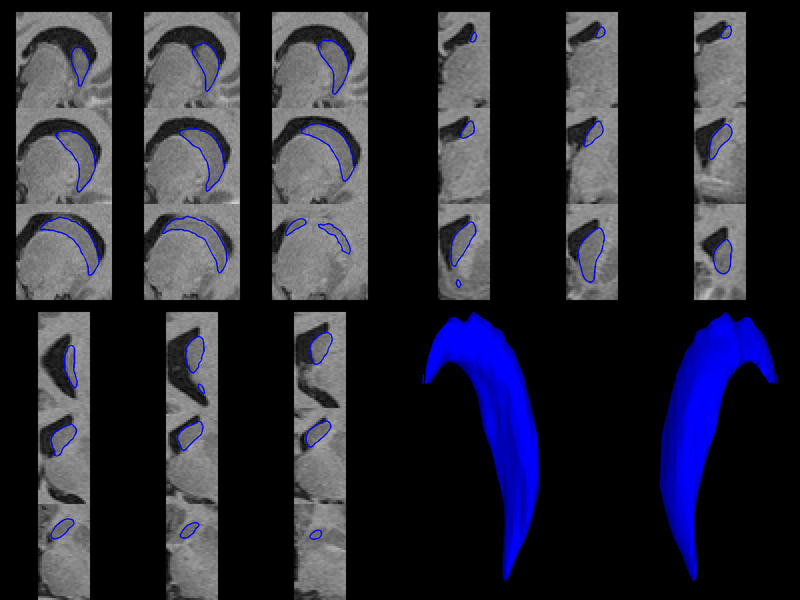 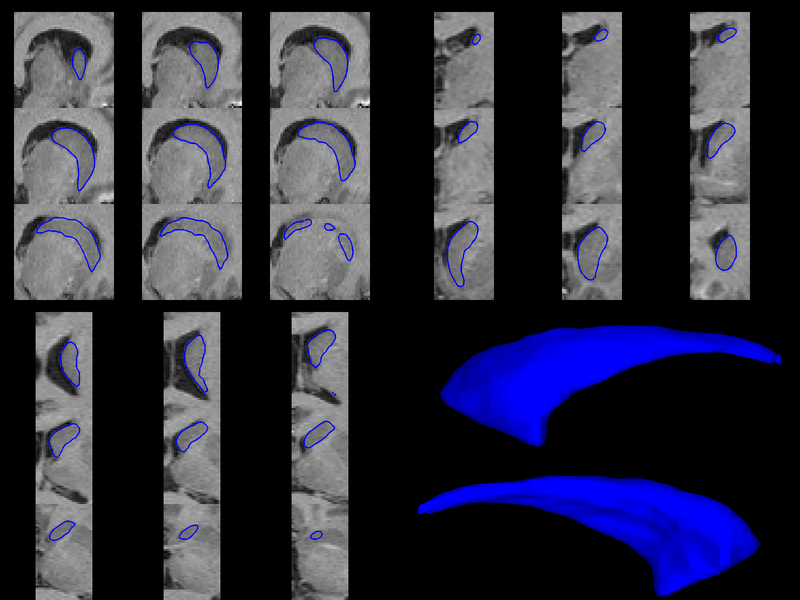 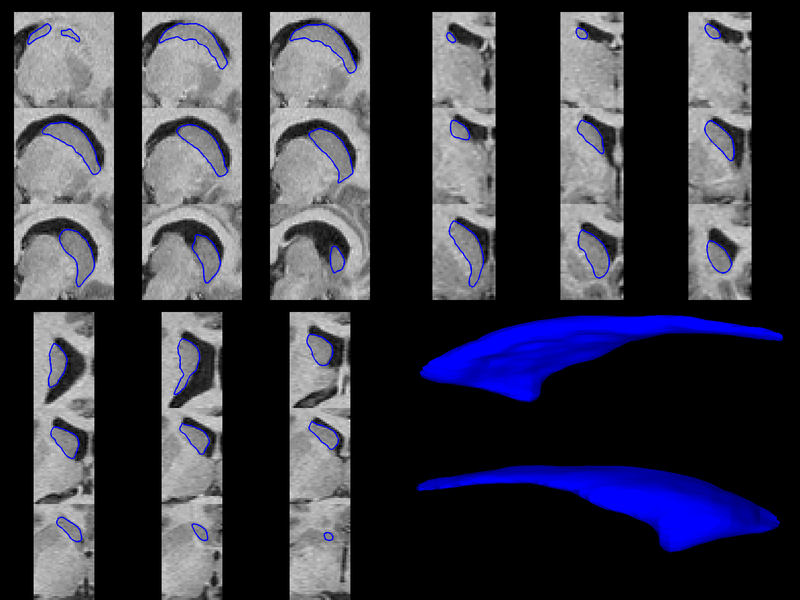 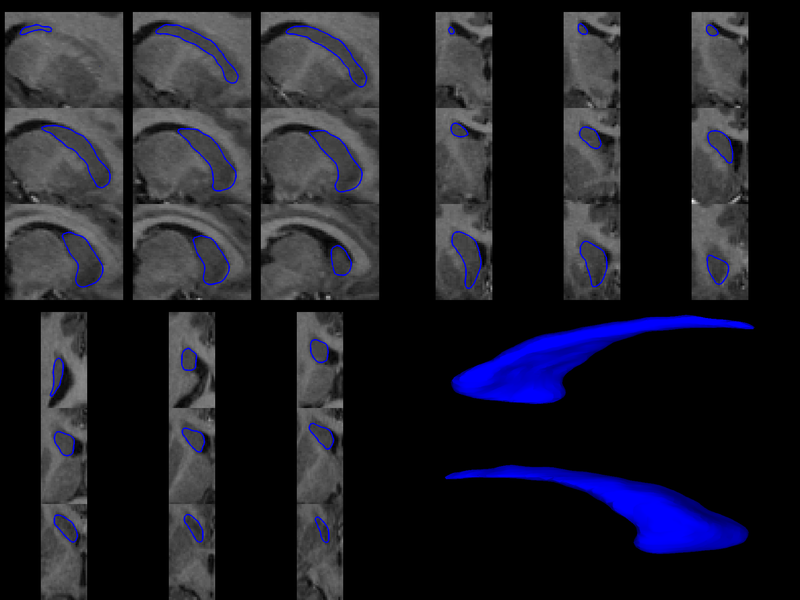 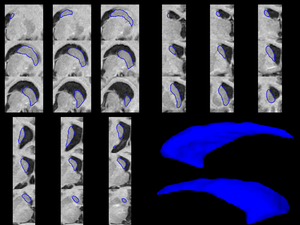 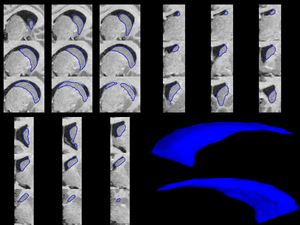 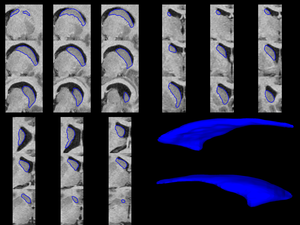 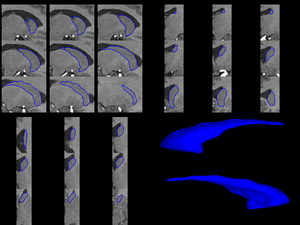 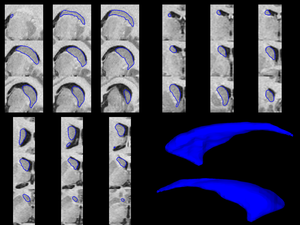 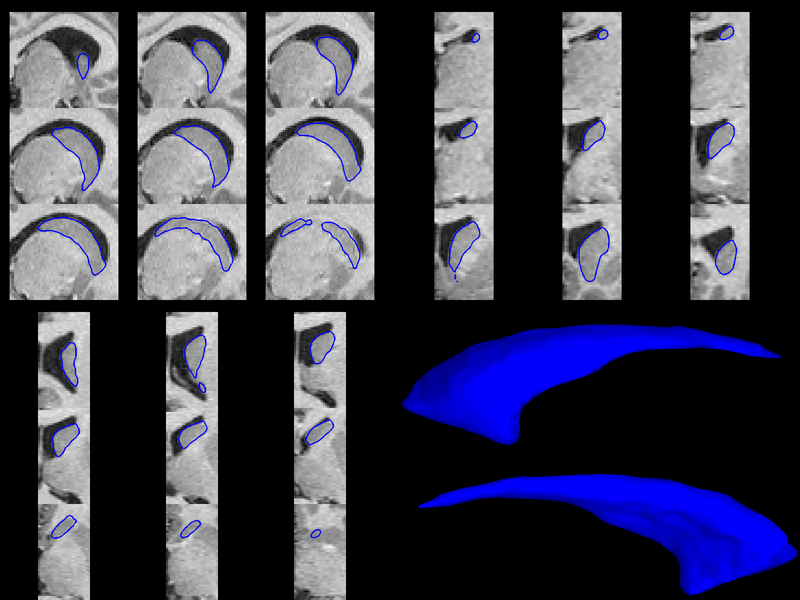 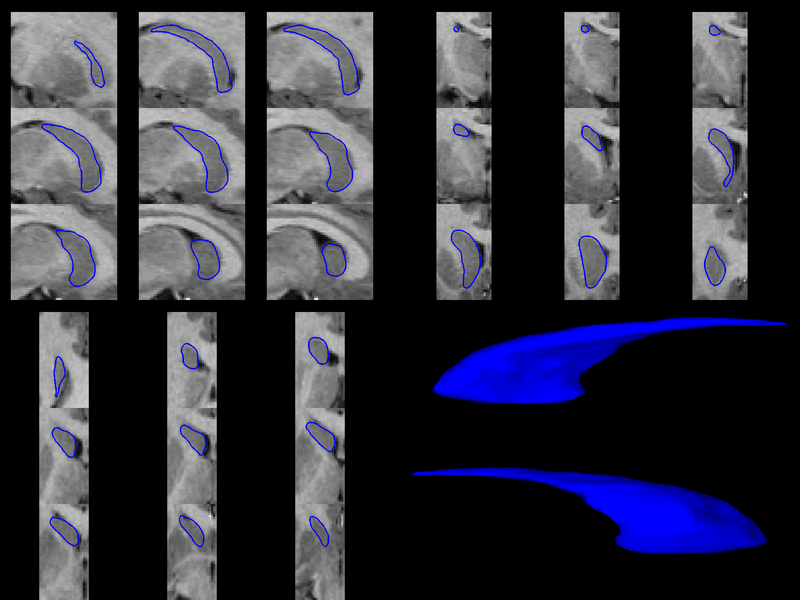 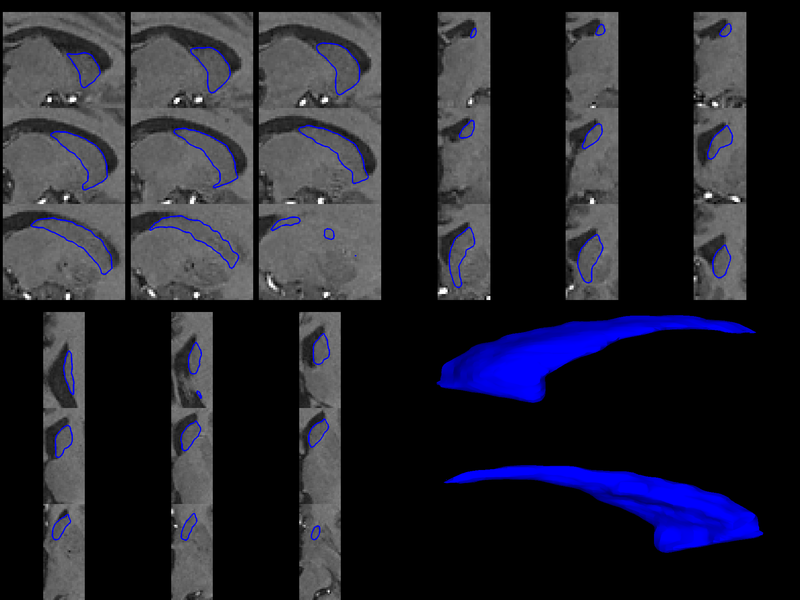 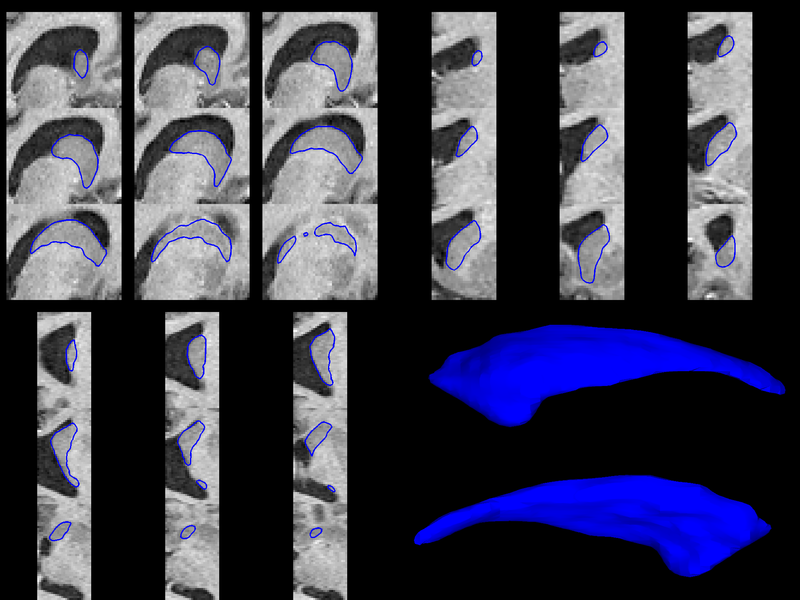 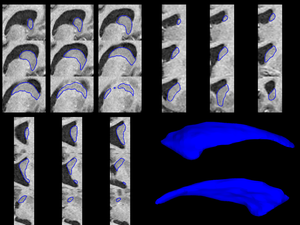 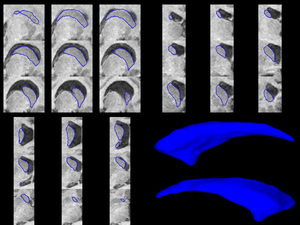 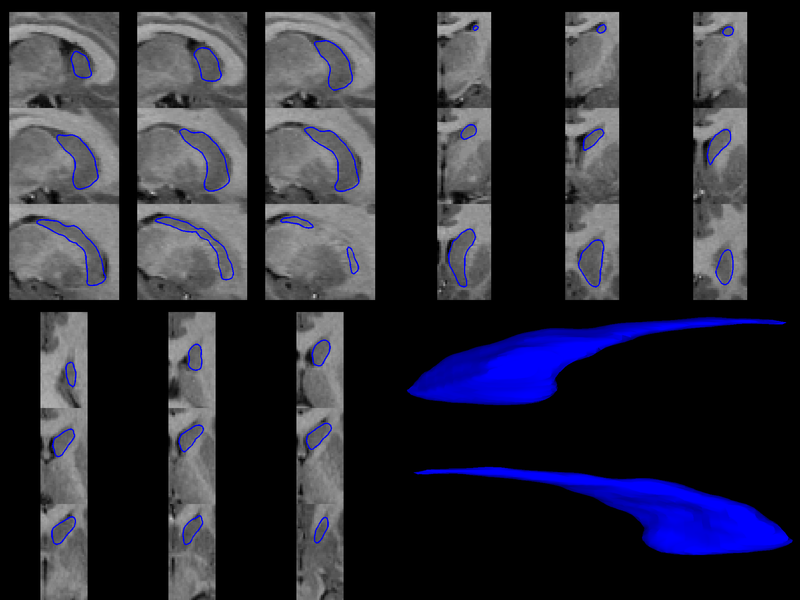 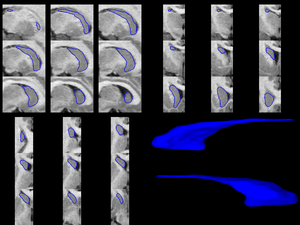 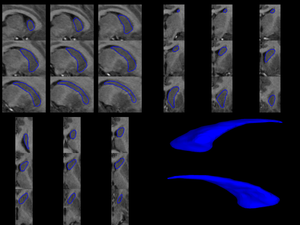 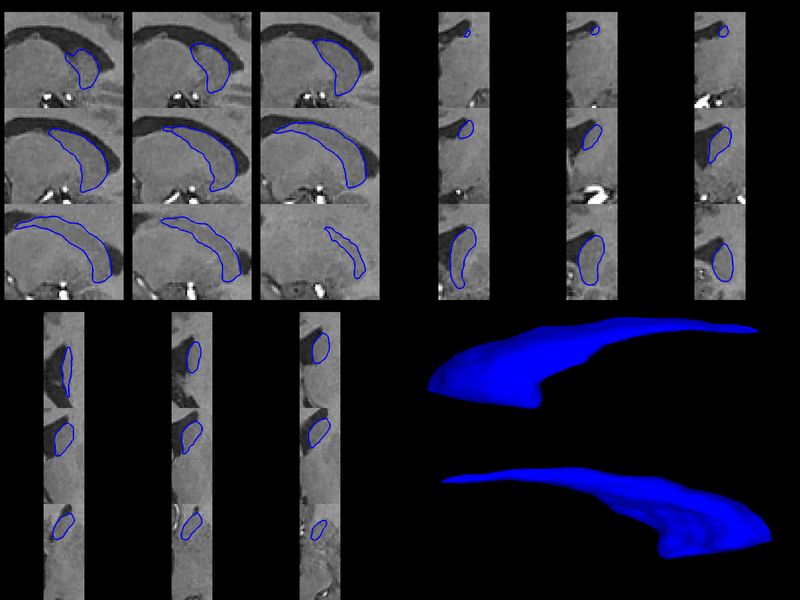 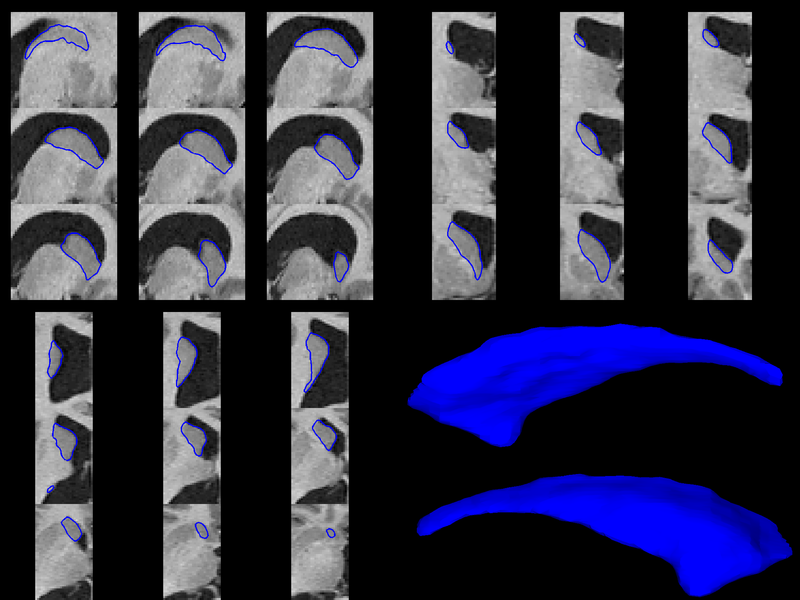 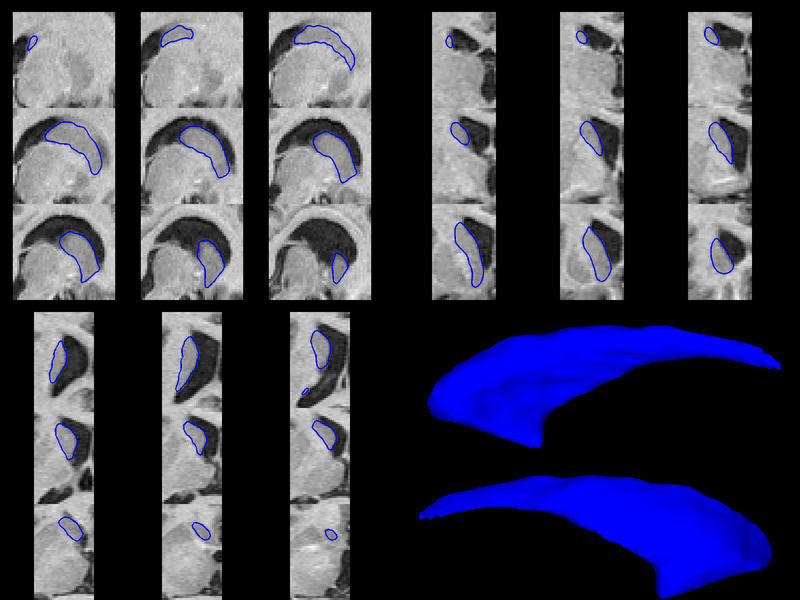 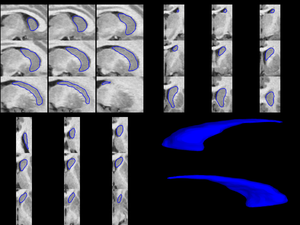 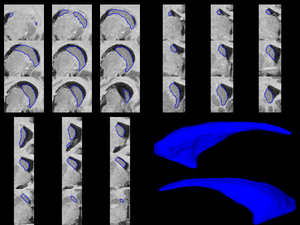 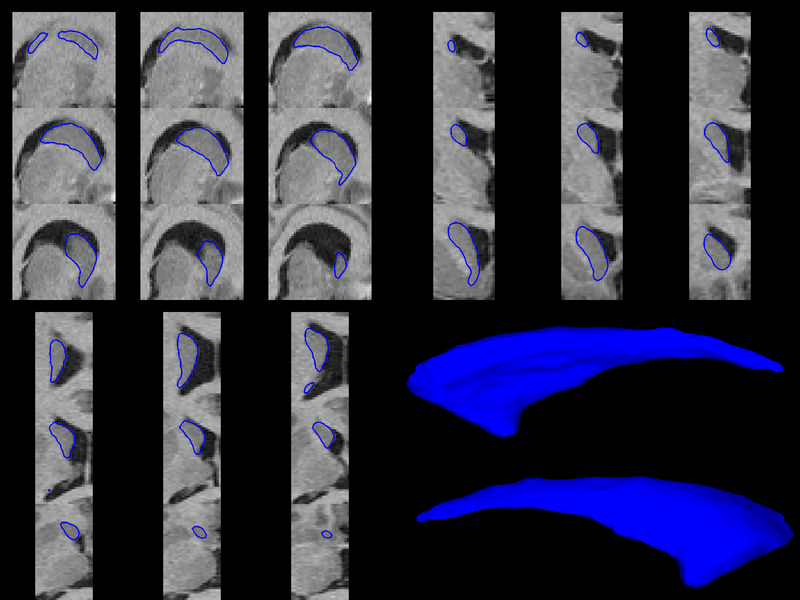 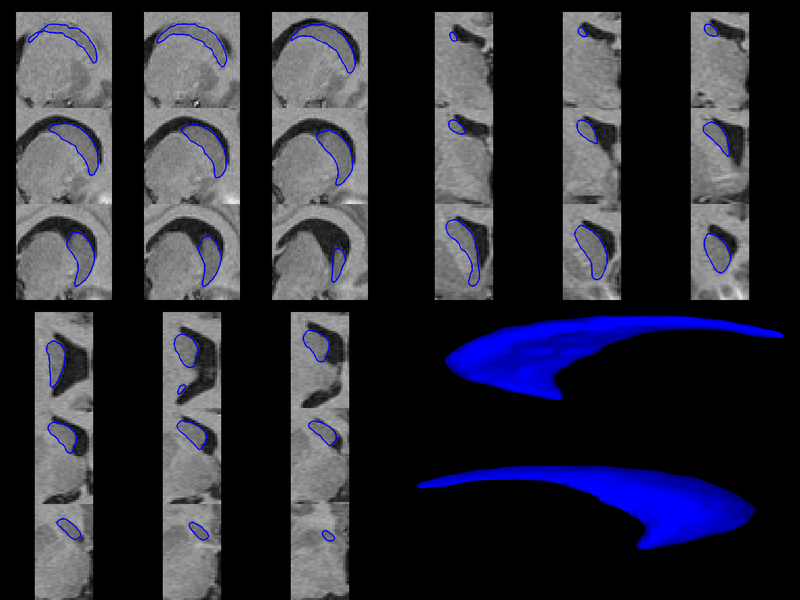 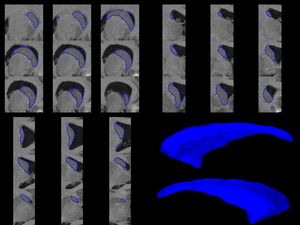 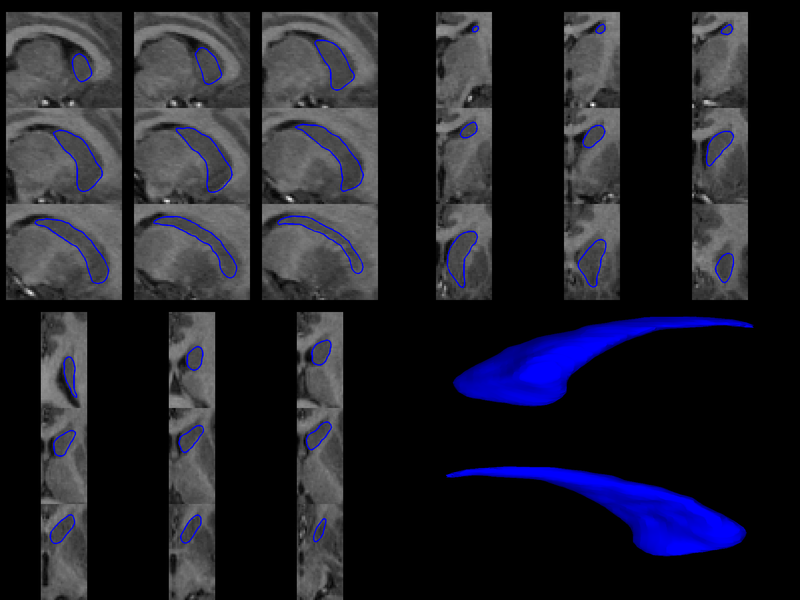 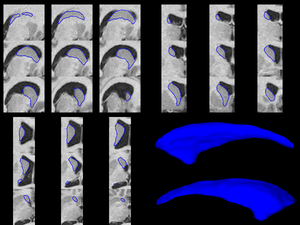 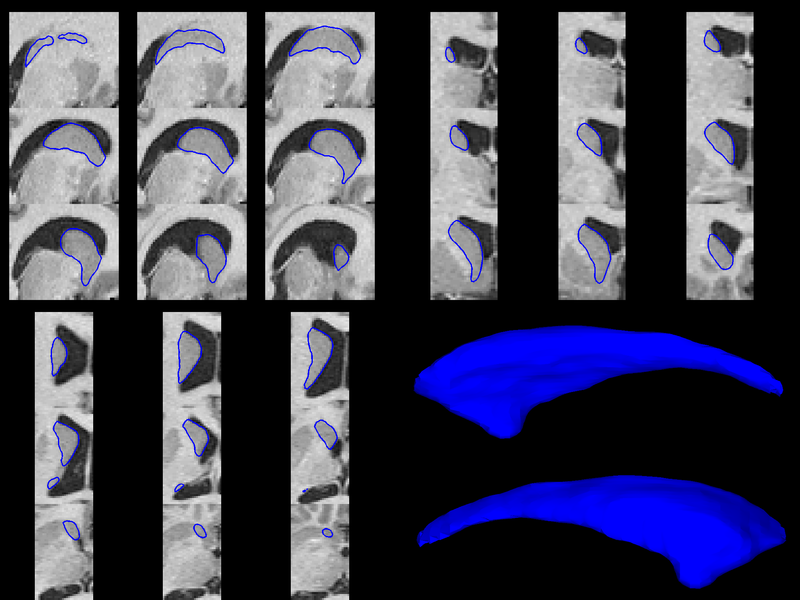 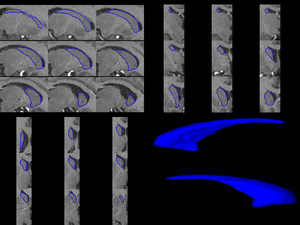 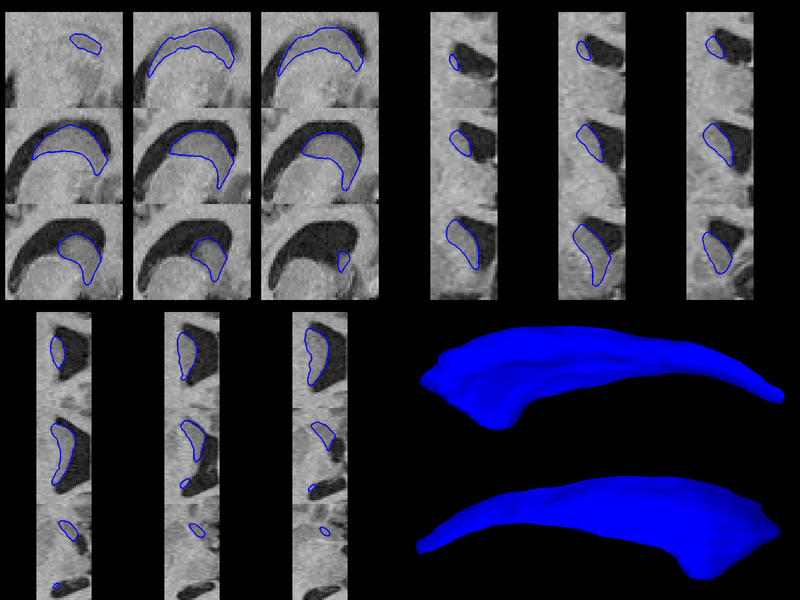 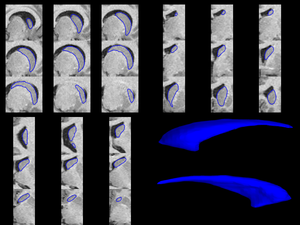 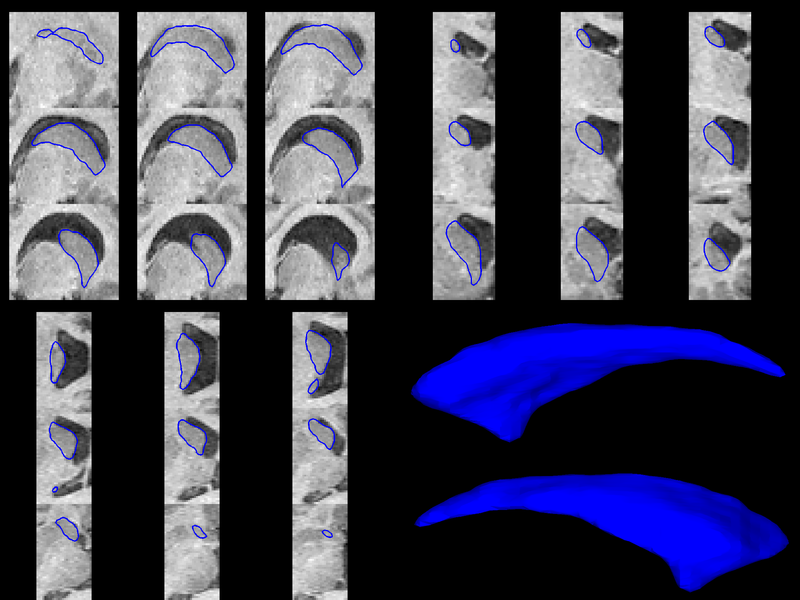 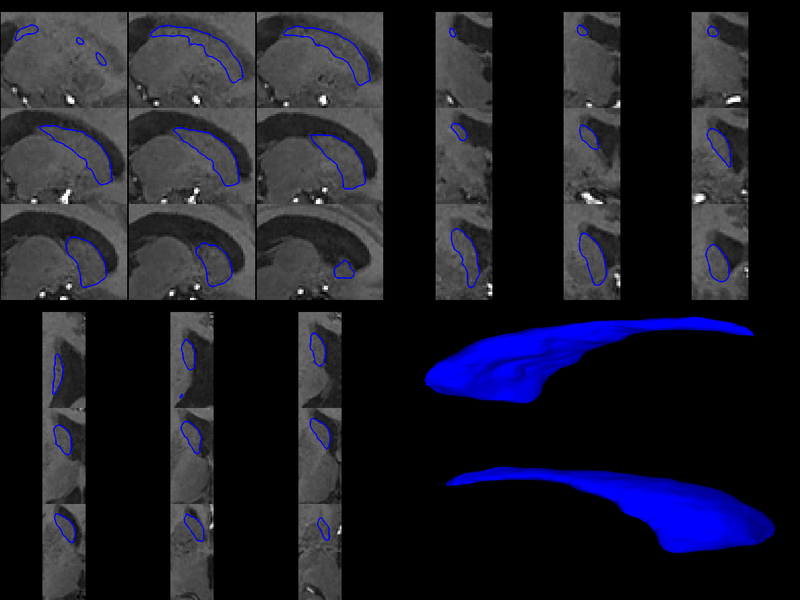 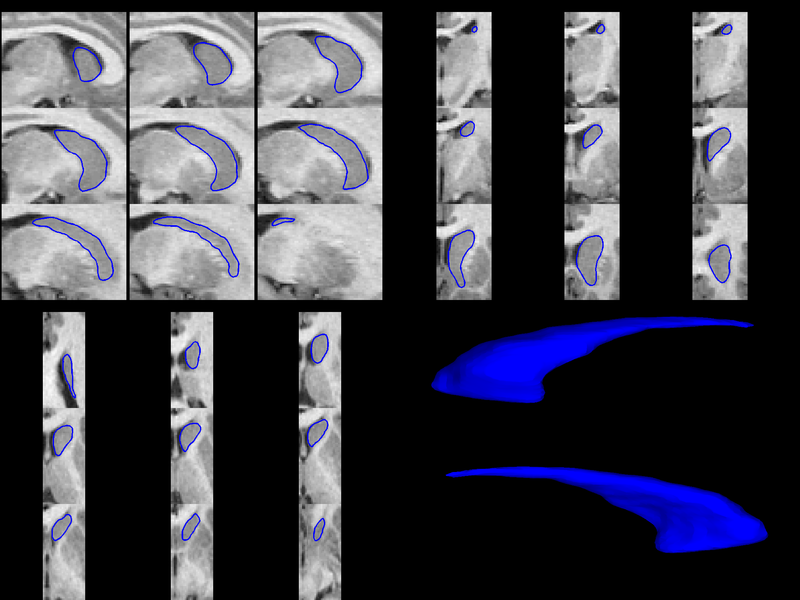 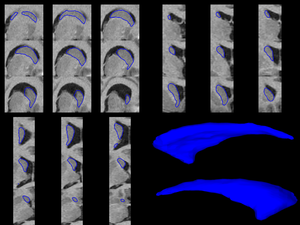 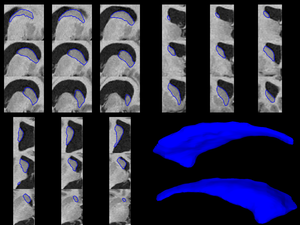 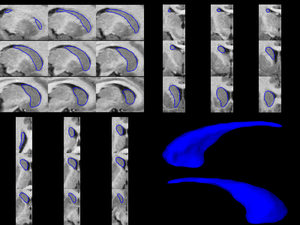 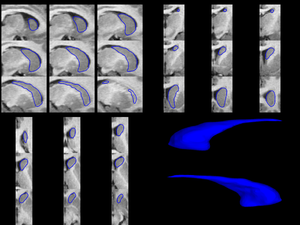 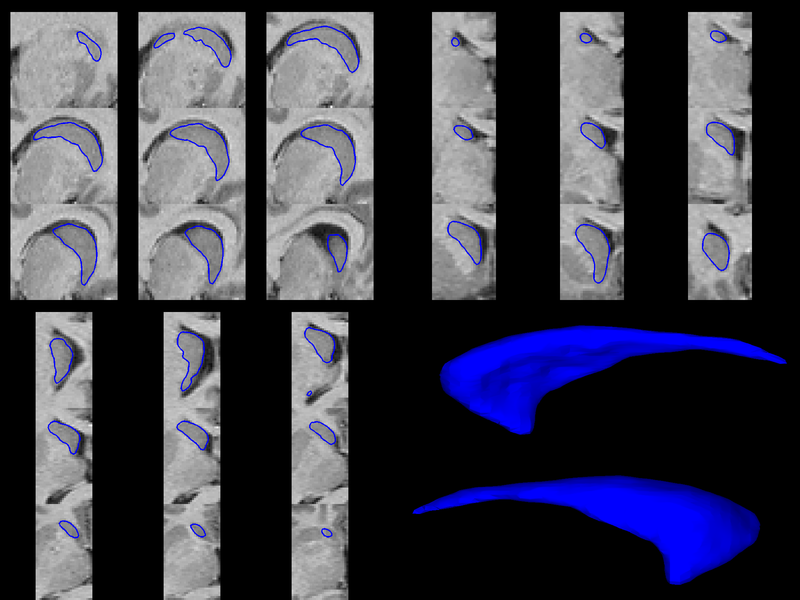 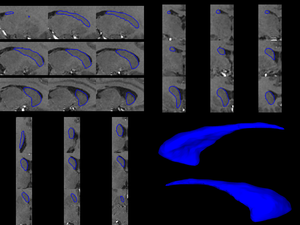 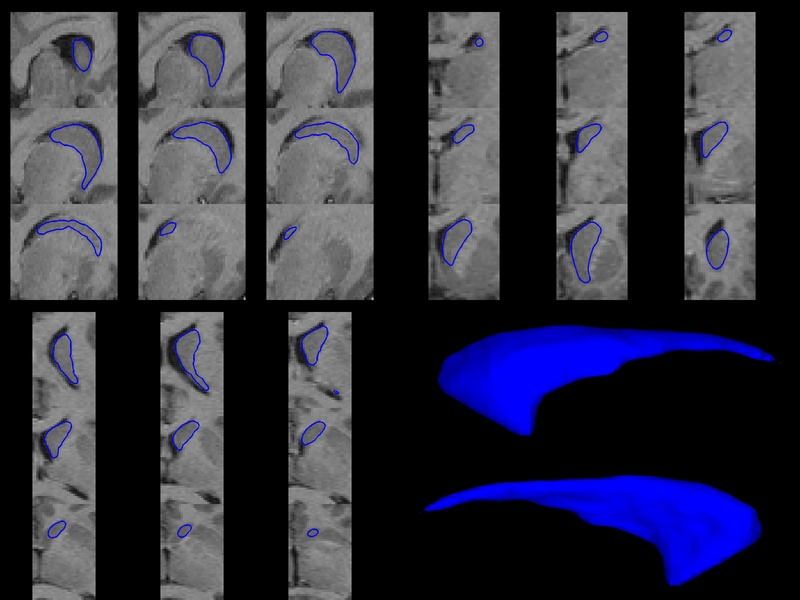 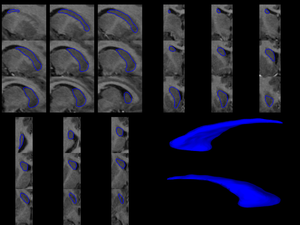 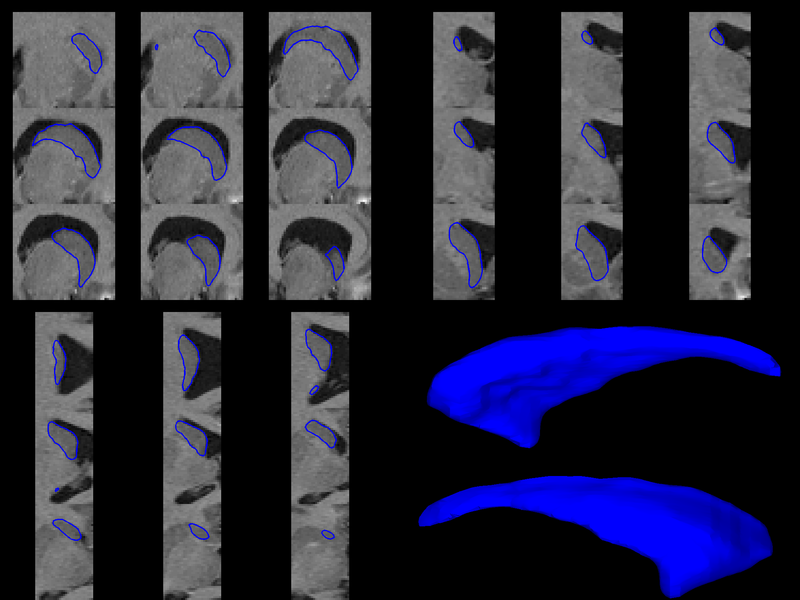 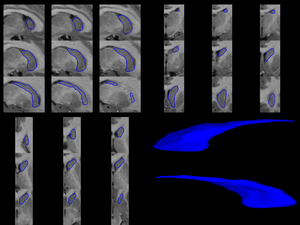 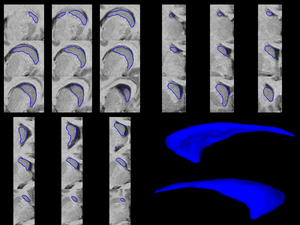 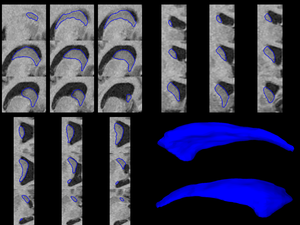 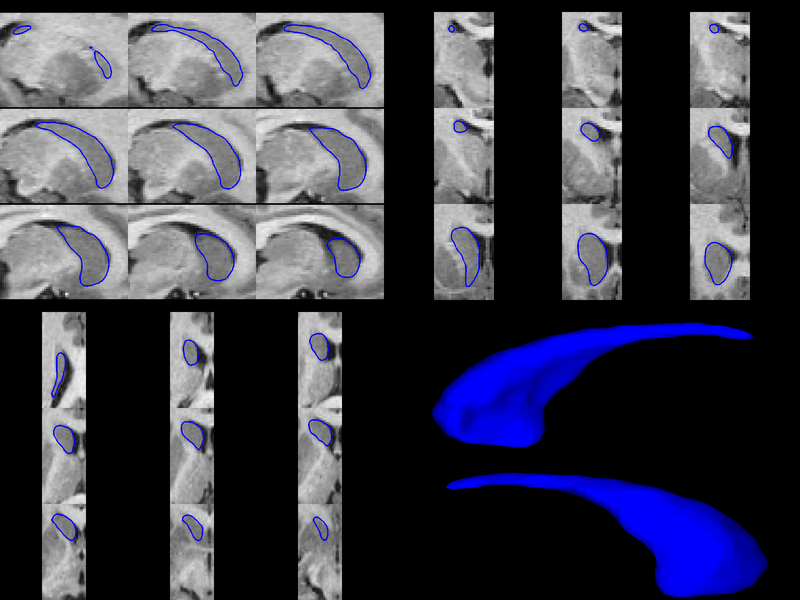 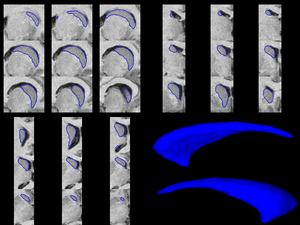 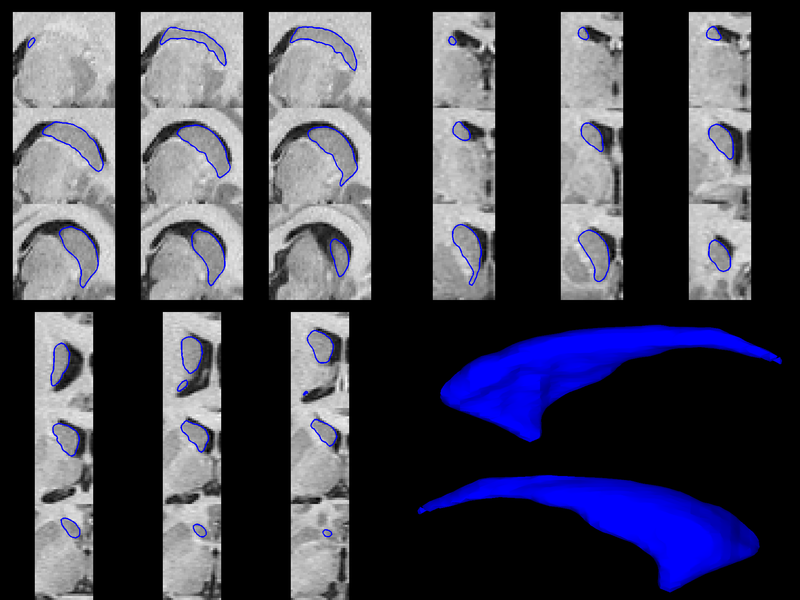 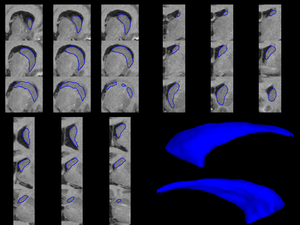 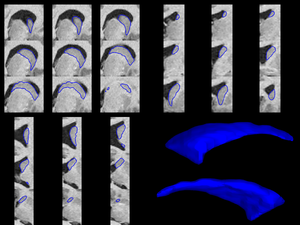 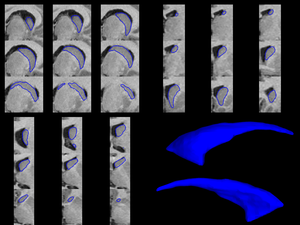 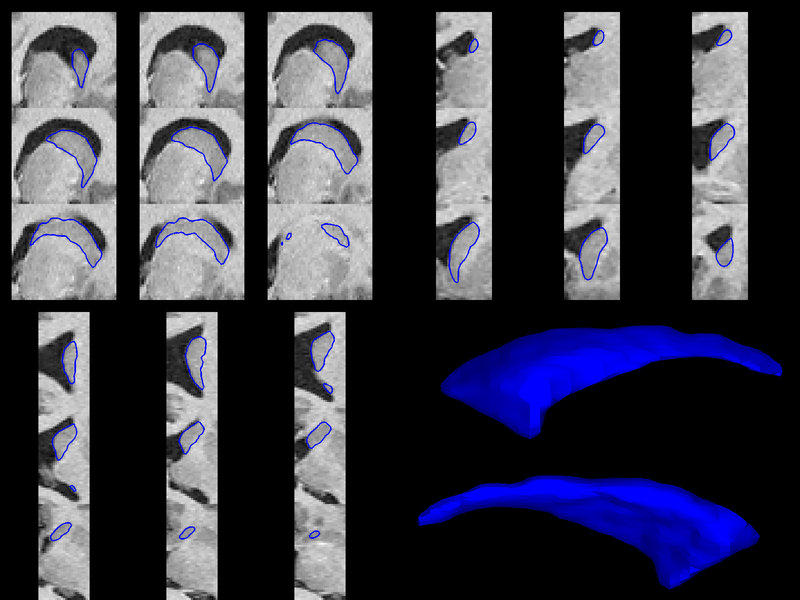 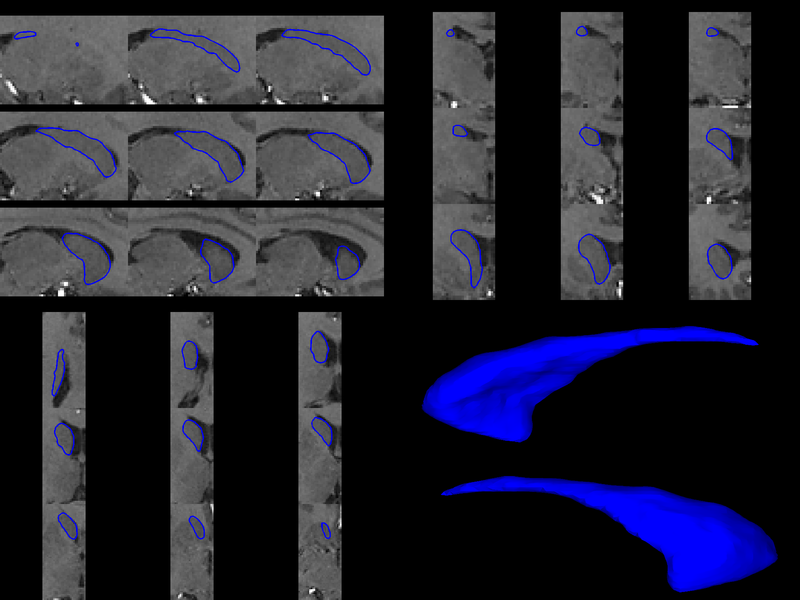 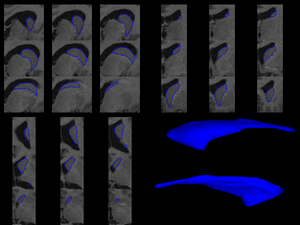 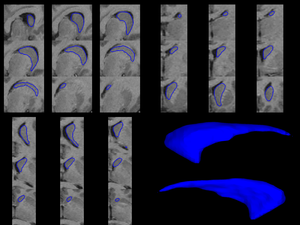 The manual delineations for this dataset included long and narrow caudate tails which were missed by our method for some subjects, thus explaining the low score for max surface distance. 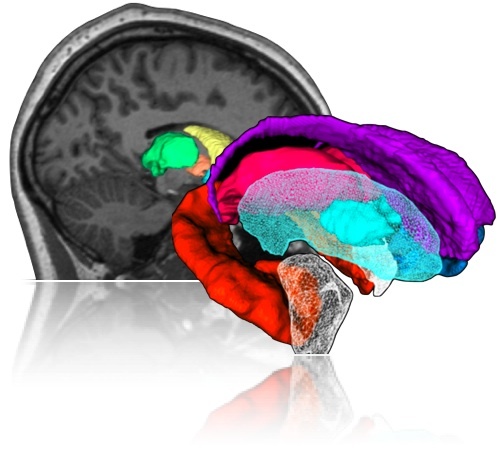 Five Pediatric (age 2-4 years) subjects provided by UNC autism research group, University of North Carolina at Chapel Hill. 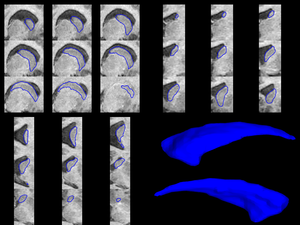 Five Elderly (age 60-75 years) subjects provided by UNC Parkinson research group, University of North Carolina at Chapel Hill.